ASIA/PHILIPPINES - Mid-term elections, Cardinal Tagle: "To put the country in good hands"
Manila (Agenzia Fides) - We must put the country "in good hands", hands that are generous and supportive, so that Filipino society is better, "welcoming as a womb that gives life": said Cardinal Luis Antonio Tagle, Archbishop of Manila who, as Agenzia Fides learns, expressed his views on the situation in the country, in view of the upcoming mid-term elections, which will be held in May. The vote will elect the House of Representatives, 12 senators and renew all the posts in the regional, provincial and municipal administrations. 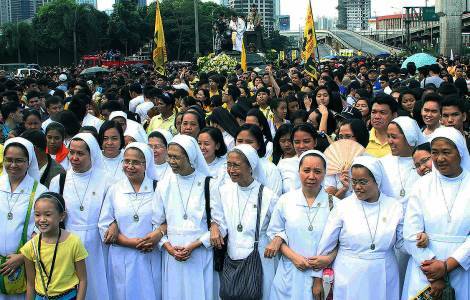 The Cardinal celebrated Mass during the “Walk for Life” held at the Quezon City Memorial Circle, in Quezon City. And he said: "We hope that this walk for life can be a march to build a welcoming society like a mother's womb, a space that is harmoniously shared by people, communities, leaders. We want our society to become like a life-giving uterus", because "the hands of those who live there are generous, not greedy". Cardinal Tagle recalled that "Jesus taught and showed the logic of giving: the action of proximity and charity requires a generous commitment of solidarity for others". "A small quantity of bread, if it passes through good hands, will multiply", he explained, commenting on the Gospel passage of the multiplication of the loaves. "On the other hand, even 7000 loaves, if managed by greedy people, will not be enough for four people", he continued. "They are hands that kill, and this is a damage not only to society but to creation, which generously takes care of us", he said. Many young people were present at the event. The March for life, in which the Filipino Church every year places the accent on life and on the inalienable dignity of every human being, took place on February 16th also in the cities of Dagupan, Tarlac, Cebu, Ormoc and Cagayan de Oro, as well as in the cities of Palo and Palompon. Referring to the May elections, Bishop Crispin Varquez, at the head of the diocese of Borongan, also invited the faithful to "vote responsibly to correct the distorted values that characterized the past elections". According to Bishop Varquez, "people will vote for politicians inspired by good governance". ASIA/PAKISTAN - Cardinal Coutts: "A new wave of harmony and peace, in Pakistan and the Middle East"
OCEANIA/PAPUA NEW GUINEA - Church appeal: "Manus refugees await freedom"